Wrong parts sent twice and still not sorted out. After investigation we realised the customer had been sent an incorrect (older version) instruction manual as we have recently made improvements to the trike by reducing the amount of nuts, bolts and washers used in order to make assembly easier. Once we realised the error we emailed a file of the instructions to the customer. 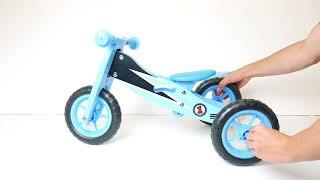 We are happy to say that the wooden trike can now be assembled correctly.